With summer heat baking much of the nation, it’s a good time to review some of the basics of watering. Our horticultural advisors have lately received a number of contacts about issues pertaining to plants that are being either under-watered or over-watered. Automatic sprinkler or irrigation systems are a convenience for many gardeners, but they need to be properly programmed and adjusted for weather conditions. We’ve all seen sprinkler systems running after (and even during) a deluge. Auto irrigation systems also are generally the culprit when watering is being done in 15-minute intervals. 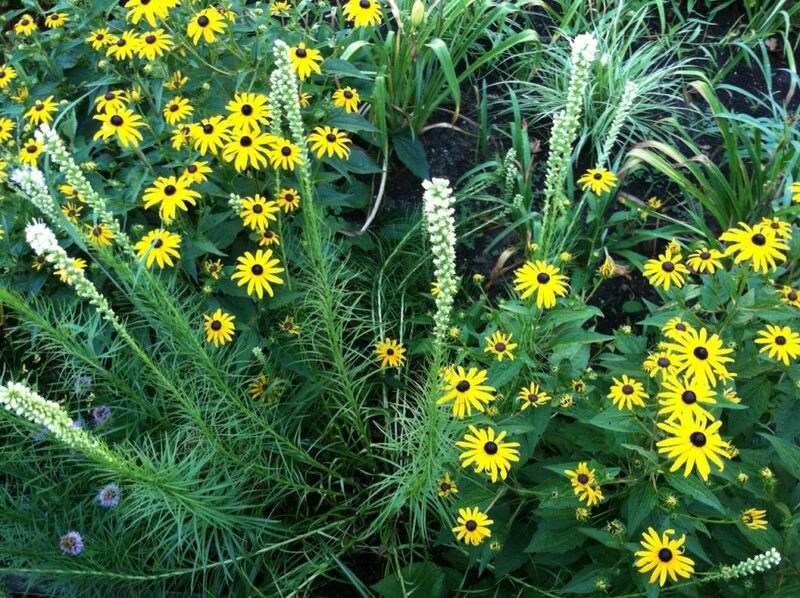 When the soil is dry, established perennials should be watered to a depth of 2 inches. Check the moisture level of your soil by sticking your finger in the dirt, or push a spade in and remove a clot of earth to see how deep the dryness goes. 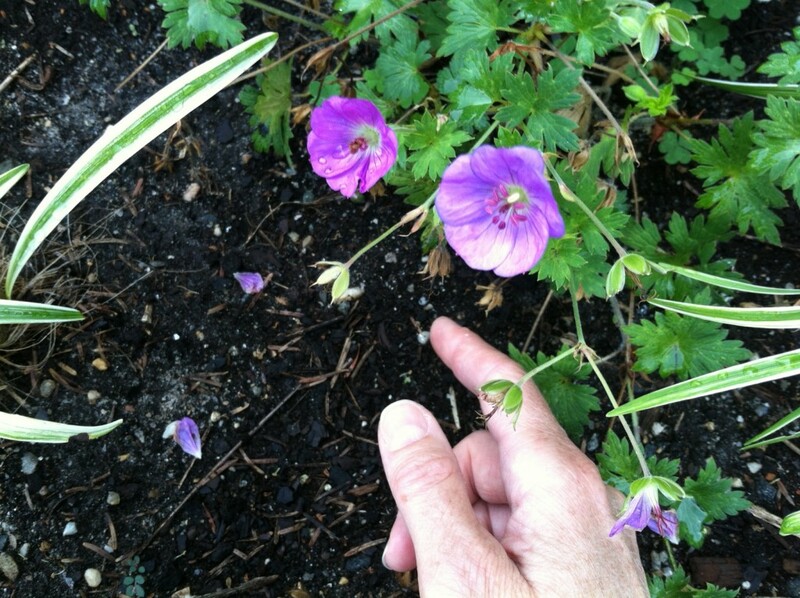 As a general rule of thumb for established perennials, Cathy advises “watering when the soil is dry to a depth of 2”, and always checking the soil before watering because hot weather does not necessarily mean the soil is drying out, especially if conditions are humid.” In addition, plants may wilt as a response to high temperatures, but the soil may still be moist. If the plant recovers either late in the day or early in the morning, and you have not watered, this is a clear indication that the soil is still moist. The best way to check the soil is to stick your finger in the dirt, or push a spade in and remove a clot of earth to see how deep the dryness goes. Not all plants require the same amount of watering. Hand-held watering devices can help direct water to the plants that need it most. 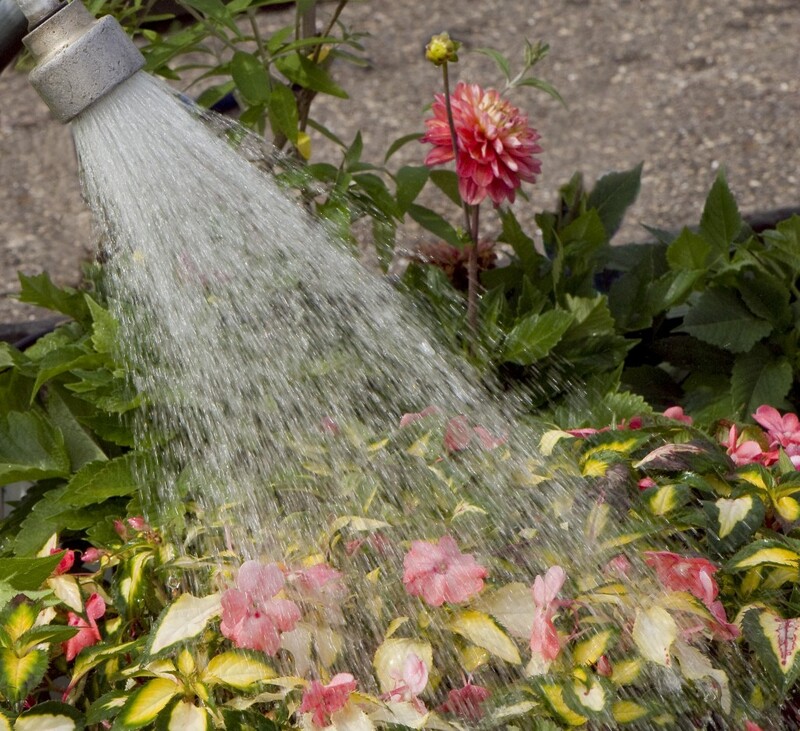 Gardeners should keep in mind that different plants have different watering needs. 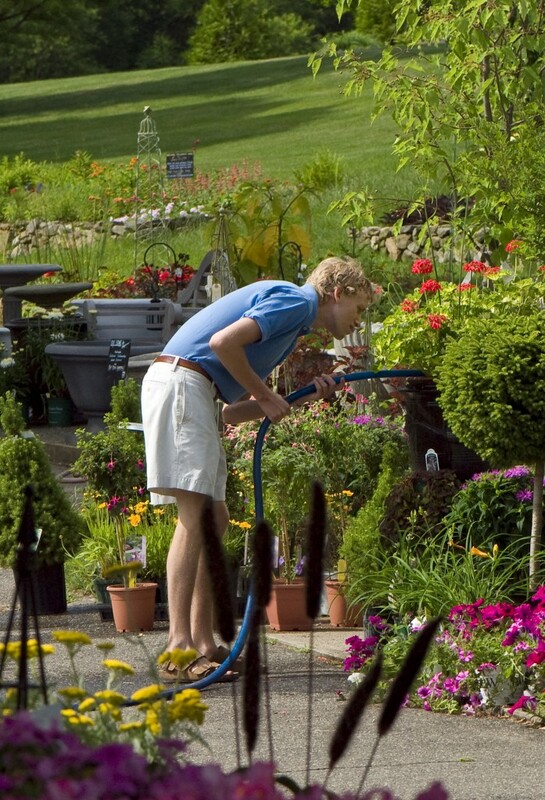 Annuals, which are planted in spring and give their all in one season, generally need more water than perennials that have many seasons to develop root systems; plants situated in full sun almost always need more water than those in shade; plants that live beneath large trees, where they’re forced to compete against tree roots for water, will need more hydration support than most; and new plantings will require more regular watering than established plants. Container pots should be checked daily during the hottest weather. Container pots are a different story. They tend to dry out quickly, especially if pots are made of porous materials such as terra cotta. Most pots, unless they’re filled with succulents and other drought-tolerant plants, will need to be checked daily especially in the heat of summer. So here we are already midway through July. I know I’ve left you hanging for a bit and I can tell you are hankering for more tales of the tuberous begonias. 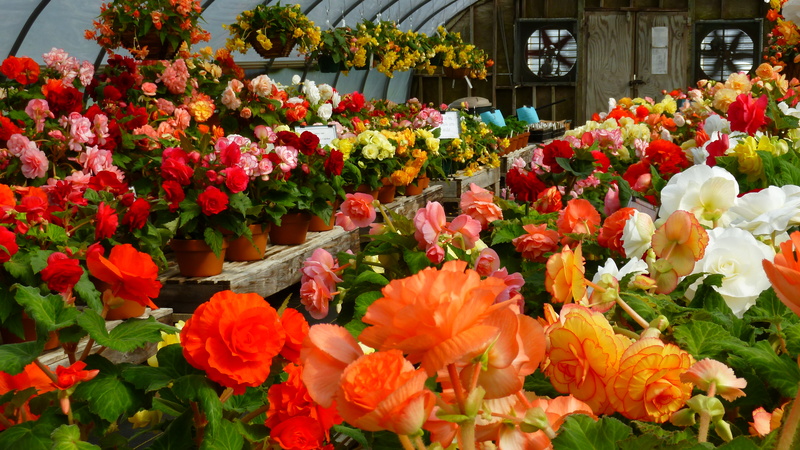 With the bulk of the garden planting done and our annual Open House in the rear-view mirror, my attention can now turn back to making the begonias happy and comfortable. 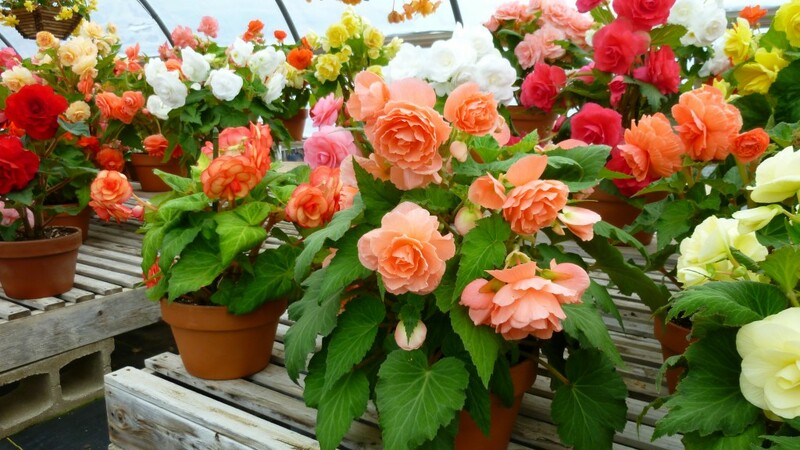 The begonias responded nicely after making their move into their final pots. They got to work rooting into their new-found foot room and in turn they increased their lush top growth in height and girth. Then the buds began to appear and the first satiny flowers of the season unfolded. We were ready for entertaining! I was able to open the doors of the display house to our visitors a week before the first of June which is my usual targeted opening day. The first few flowers of the season seem extra special to me. Maybe it’s because I haven’t seen them in months and I’ve missed them so. The first flowers are just the beginning. That one boutonniere of a blossom is the precursor to the formation of many buds and soon the plants can become heavily clad in bodacious blooms. The next task that becomes urgent as the upright begonias grow taller is staking. Even though the plant stems appear thick and strong, it is very necessary to provide some additional support for those stems so that the weight of the blooms and gravity don’t cause the stems to topple and snap away from the tuber. I provide each plant with a sturdy stake or sometimes two. I push each stake into the soil being very careful not to impale any of the precious tubers. Then patiently I go through each plant, tying in each main stem to the stake using my soft, 3-ply garden twine. 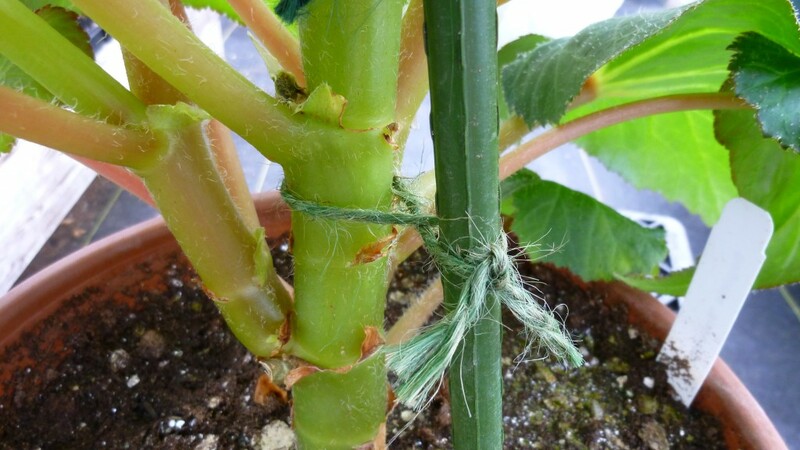 I like to loop the twine around the plant stem first and then cross it over and loop around the stake making a figure eight with the twine. The stem still has room to grow without being girdled by the twine and the knot seems to stay put where it’s tied around the stake. 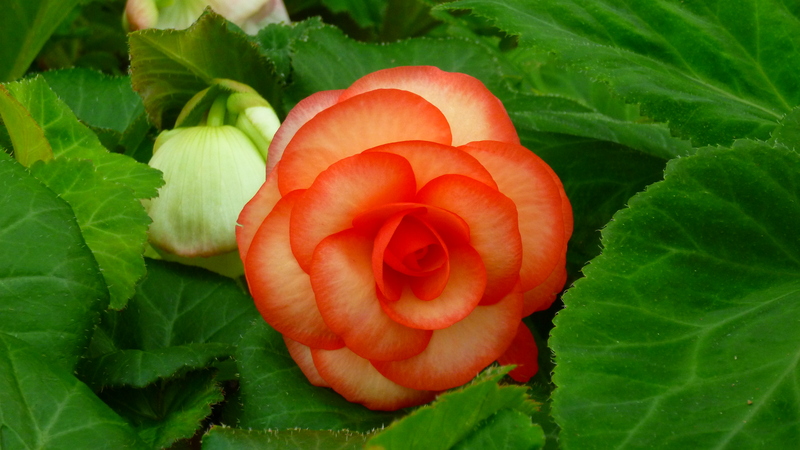 Even though the Begonia stems appear thick and strong, it is necessary to provide additional support for those stems so that the weight of the blooms and gravity don’t cause the stems to topple and snap away from the tuber. As summer progresses I settle in to my daily routine of begonia upkeep. I check each plant daily for water needs, allowing the soil of each to become dry between watering. I don’t allow the plants to be dry for too long especially on hot, sunny days when the possibility of wilting looms. 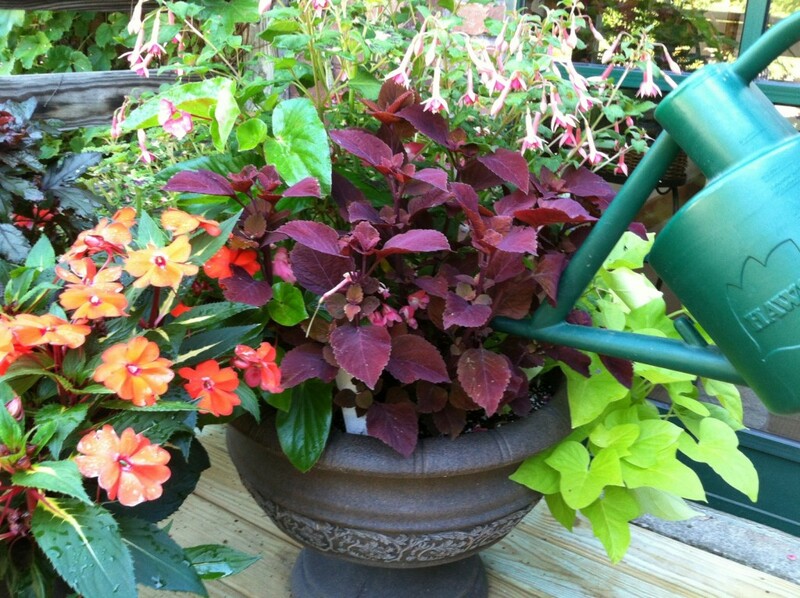 I give the plants the daily once-over removing any spent blossoms and the occasional unsightly leaves that may appear. At the same time, I double-check the plants for adequate staking. As the plants continue to grow, I sometimes have to add more ties or stakes to ensure my plants continue to stand tall. Aside from the bit of time it takes to do the daily chores, the rest of the summer can be spent enjoying the fantastic flowers! I thought I’d introduce you to some of the family . 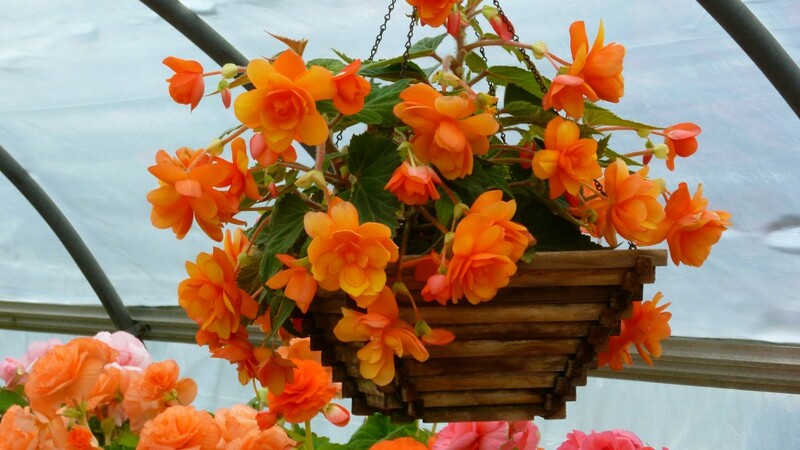 . .
Blackmore & Langdon Tuberous Begonia ‘Firedance’ in a hanging basket. 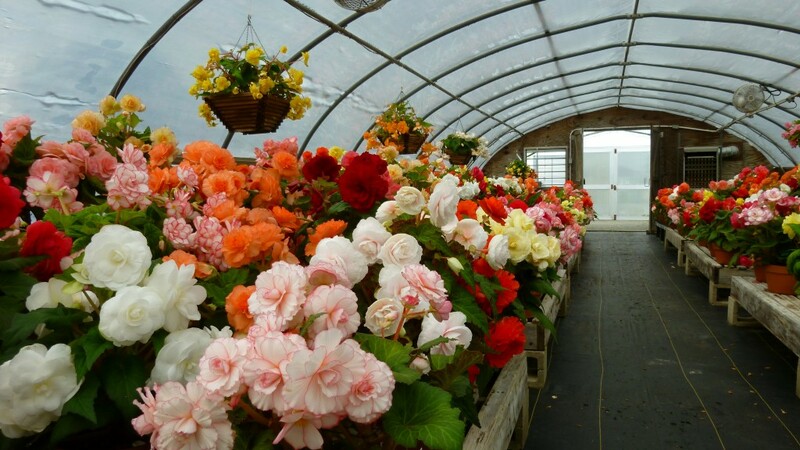 White Flower Farm’s Begonia House at the height of the blossom season. 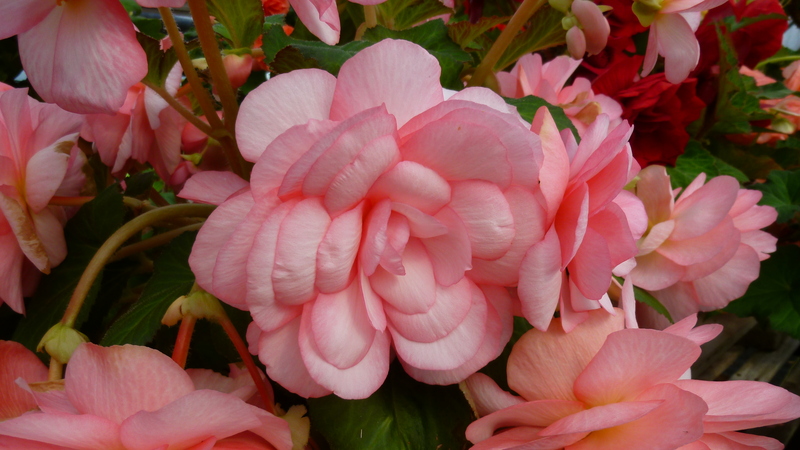 Begonia ‘John Smith,’ center, a fragrant variety with a fruity spicy scent. The sky was full of thunder on the afternoon we visited Elizabeth Park in Hartford and West Hartford (the park straddles the border between the two towns), but the moody sky and gusting wind only added to the drama and loveliness of being there. 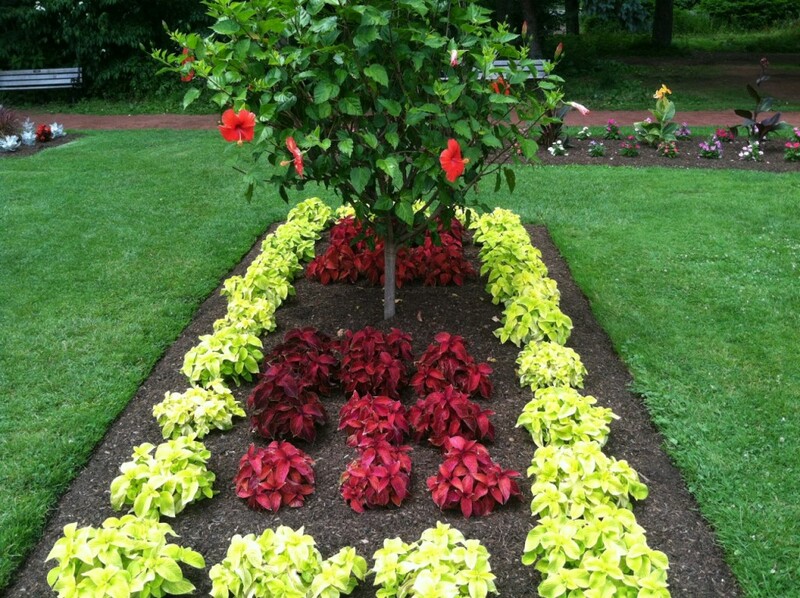 Rows of colorful coleus form a rectangular frame around a lollipop-shaped Hibiscus standard. Set on 101 acres, the park is an oasis of land that was deeded to the city in the late 1800s by Charles Pond. While Pond’s property already featured specimen trees and other existing plantings, the city expanded on his vision to create what is regarded as a “botanical park.” Swiss-born landscape architect Theodore Wirth, who had designed gardens in Paris and London, was commissioned to create formal Victorian gardens including the park’s world-renowned Rose Garden. Elizabeth Park opened to the public in 1897, and the Rose Garden was christened in 1904. The Rose Garden was and remains the country’s first-ever municipal rose garden, and today it ranks as the third largest. 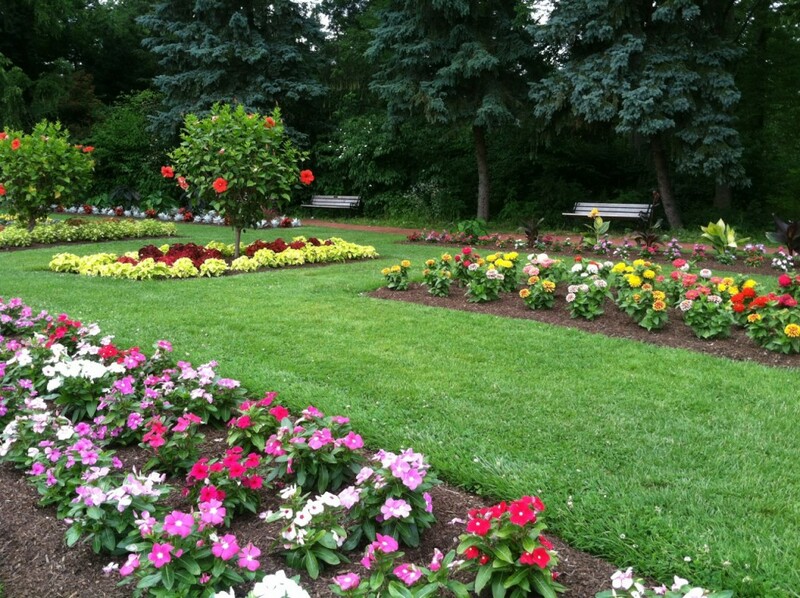 It’s just one of the horticultural attractions at the park, which also include an Annual Garden, a Perennial Garden, a Shade Garden, a Heritage Rose Garden (for exceptionally old rose varieties), and various gardens designed and maintained by local and regional horticultural societies. The Elizabeth Park gazebo was originally built in 1904. It was reconstructed according to the original design in 2005. 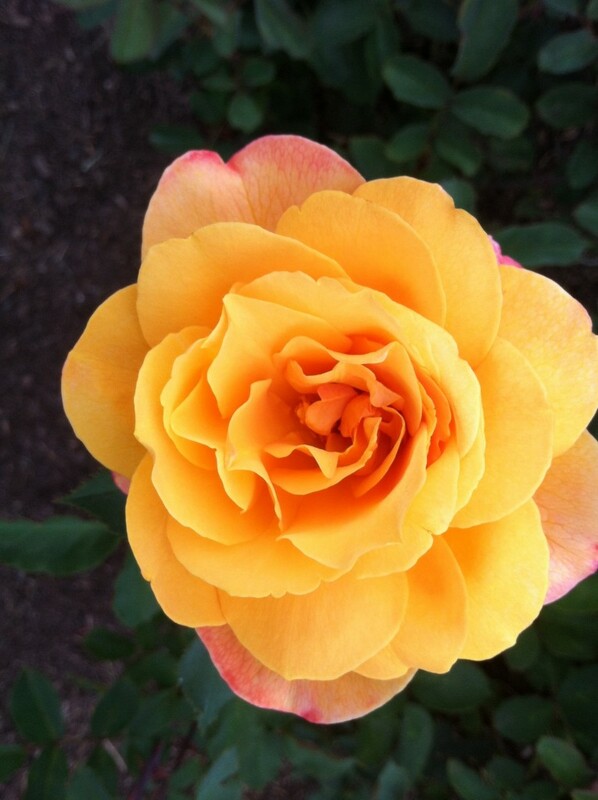 Our visit was timed for peak season in the Rose Garden. Wirth’s original design created an acre-sized square with a center circle and eight pathways radiating from a gazebo. Today’s garden retains his design, but it’s been expanded to bring the total number of acres to 2.5 with 475 beds. 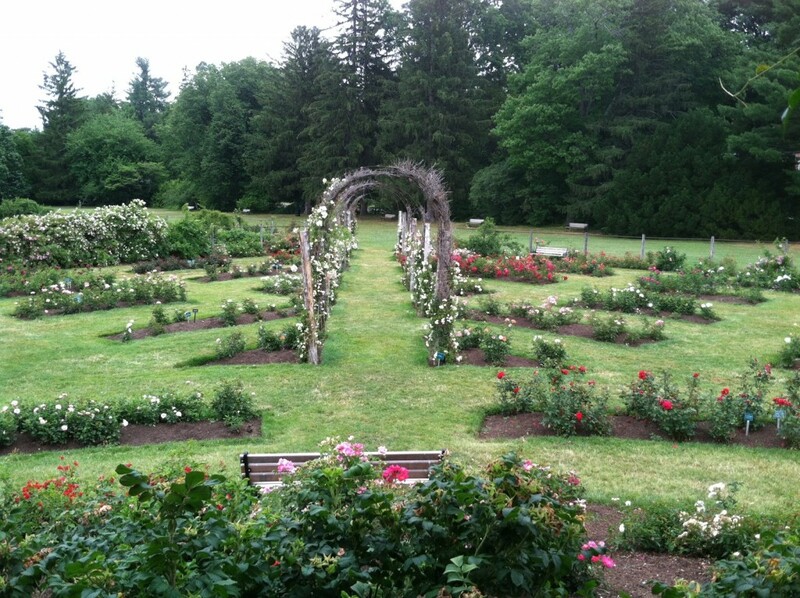 The original Rose Garden featured 190 varieties of roses, and that number has grown, too. 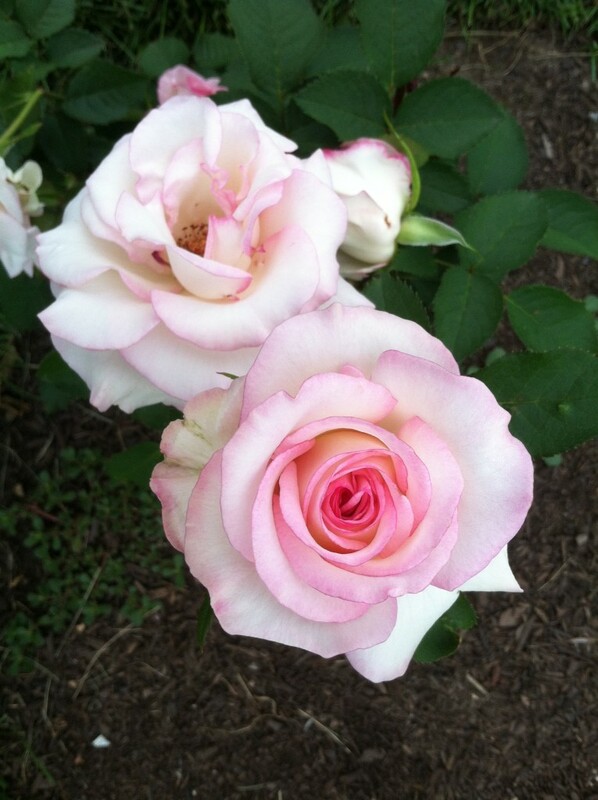 According to the Elizabeth Park website, there are now 800 varieties of roses, a mix that includes old and new types in a range from hybrid teas to floribundas, and climbers to shrub roses. 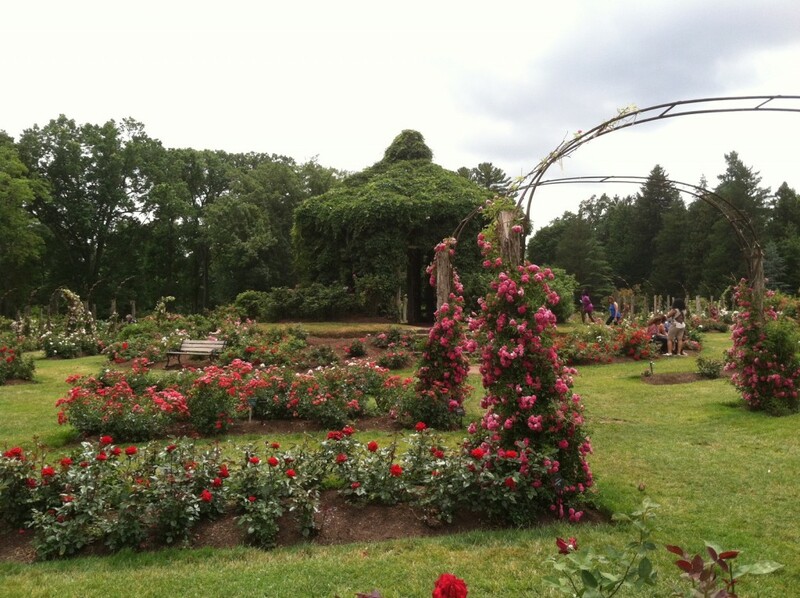 The rose garden contains more than 800 varieties of roses, a mix of old and new. As we strolled and sniffed our way along the garden beds, clusters of people milled around us, taking pictures and quite literally taking the time to smell the roses. Adjacent to the Rose Garden, the Annual Garden was also attracting plenty of attention with its colorful, formally planted flowerbeds. In spring, the beds are filled with more than 11,000 tulip blossoms. When the blooms subside, the tulip bulbs are dug up, bagged, and sold to the public. The beds are then planted with artful displays of annuals, which have been grown from seed in the park’s greenhouse. Today, Elizabeth Park remains open 365 days a year, welcoming locals and visitors who walk, picnic, practice yoga, take in entertainments including music concerts and movies, and, of course, spend time in the gardens. Plan a visit yourself, and enjoy the beauty of this lovely urban oasis.